A drive to do something a bit different has resulted in one crofting family joining the pedigree Highland cattle set. Kenny and Lesley Matheson, along with their nephew Calum Mitchell, have built up a fold of 23 pedigree Highland cattle in the past 15 years. Despite a spinal injury in the 1980s resulting in him becoming a wheelchair user, Kenny has pushed forward with his vision to breed good-quality pedigree cattle on the island. Together with wife Lesley, he has successfully built a profitable and innovative crofting business in Brue on the west side of the island. “In 2000 UK agriculture was on its knees and my nephew, who had been working with my grandfather, took the lambs to the market in Stornoway and got £25 for them,” said Kenny. After a lot of thinking, Kenny says they decided “to do something different”. “The two things that were dramatically different were that we decided to go down the pedigree route, and that we decided to take over the marketing of our own produce by selling both the livestock and the beef,” he said. After much research and speaking to other crofters and farmers, Kenny said they had to chose between breeding Highland or Shorthorn cattle and the hairier of the two won. 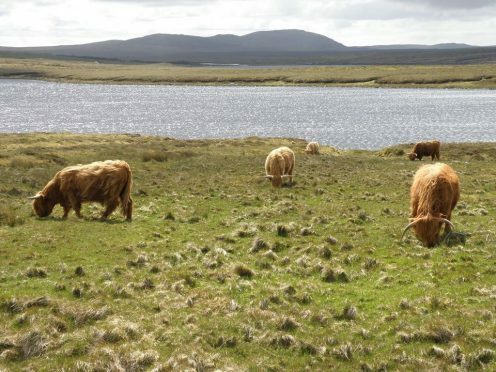 “Highland was chosen because they [cattle] would have to survive and thrive in this climate regardless of what the weather threw at them,” he said. Kenny, who during the day works in IT in the local education department, said it was a steep learning curve for everyone involved. Once the decision had been made to go for Highlands, Calum, then aged 17, was sent to Oban to buy the first stock. He was told to meet up with Bob McWalter, who was the stockman at the Glengoy Estate, and help him showing cattle. “We sent him [Calum] there with a mobile phone and two blank cheques, after getting the ferry and the bus to Fort William. And with the help of Bob, he ended up buying two heifers,” said Kenny. After taking the heifers on the 245-mile journey home, the trio then set about getting to know the cattle and in 2002 started showing them at local agricultural shows. Over the years they then set about expanding the herd and in 2005 sold their first yearling bull, under the Brue herd prefix, in Perth for 600gn. Other bulls sold include 22-month-old bull Crusoe of Brue to the Allanfearn fold in Strathpeffer in 2008, and six-year-old bull Calum Ruadh of Brue to the Drimnin fold in Lochaber in 2011. The fold also holds the record for the highest priced Highland to be sold at Dingwall Mart. Selling at the mart’s native breeds sale in 2009, home-bred 19-month-old heifer Canach an Eilein of Brue sold for £3,000. The Brue fold has even managed to attract international attention and in June 2013 sold three heifers to Tschlin, Switzerland. It has also hosted a group of cattle breeders from Finland and Estonia on a farm visit in 2013. More recently stock from the herd has gained success on the agricultural show circuit. In August 2013, two in-calf cows, with calves at foot, were sold privately to the Noble family who run the Gleann Daidh Fold at Strachan, Banchory. One of the calves – Una A Ghlinne of Brue – was placed reserve at this year’s Grantown Show. Kenny says selling stock to foreign buyers and seeing Brue-bred animals winning championship rosettes proves that the family has achieved what it set out to. However, it isn’t all about livestock shows and sales. The family has built up a successful beef business selling boxes of Highland beef. And in November 2014, they killed their 100th pedigree Highlander for prime beef, with just over 80% going to customers in the Western Isles. All the meat is vacuum packed after being slaughtered and butchered, with the bulk of meat preparation done in Dingwall. And it doesn’t stop there – the meat is also used by Nevis Bakery, which is based in Corpach near Fort William, to produce special Highland beef pies. “The plan for the future is to keep on improving what we are doing and to try and encourage the next generation of crofters that there is a future for them if they put their mind to it and plan for the best,” said Kenny.